First thing we did was look up the Titanic. 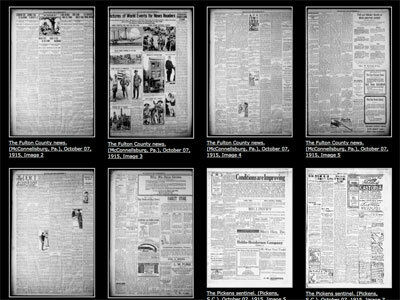 The Chronicling America database features a record of history from the pages of newspapers published between 1836 and 1922–you know, the kind of stuff normally relegated to library microfiche collections. Since it created the database in 2007, the National Digital Newspaper Program, a partnership between the Library of Congress and the National Endowment for the Humanities, has been adding pages from the past to its online, searchable collection. Today it surpassed the 10 million mark. Chronicling America is a resource used by students, researchers and journalists, and used it is. The site reports an average of 3.8 million page views per month. To celebrate and also explore 10 million pages worth of America’s reported history, the LOC will produce a series of posts on its blog, beginning tomorrow, to pay homage to the stories and obsessions of yesteryear. And what better way to link the old with the new than with an inaugural post titled, Cat Tales?